One of the most basic aspects of landscaping an area is providing a healthy lawn of grass. 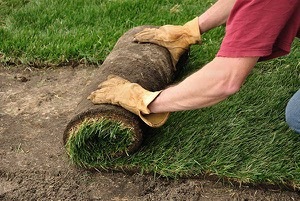 Sod is the most flexible and easiest option for upgrading your lawn. Sod is one of the fastest ways to start and establish a lawn, and it is important to know the conditions that it will be growing under when choosing the type that you want. You should look for a type that will grow well in the climate, tolerate the challenges that it will face in your lawn, and give you the appearance that you want. You should also consider maintenance needs when choosing the right sod for your project because lawn care is an on-going process. Some of the biggest benefits are eliminating many problems related to erosion, mud and dust control, less risk of failure to install it, very fast stabilization and no trouble with weeds, minimizing the future need to use herbicides. Also, sod can be laid practically any time of the year. Because its roots are developed, sod grass is able to establish itself in prepared soil in almost any season, with the exception that the land is not frozen. And if you are also interested in aesthetics, then you need to know that sod makes a denser lawn, as grass plants are sown close together so there are no bare spots. If you are looking to upgrade your lawn, look no further than A One Stop Garden Shop.